Are you looking for a complete course in Modern Hebrew which takes you effortlessly from beginner to confident speaker? Whether you are starting from scratch, or are just out of practice, Complete Modern Hebrew will guarantee success! By the end of this course, you will be at Level B1 of the Common European Framework for Languages: Can interact with a degree of fluency and spontaneity that makes regular interaction with native speakers quite possible without strain for either party. 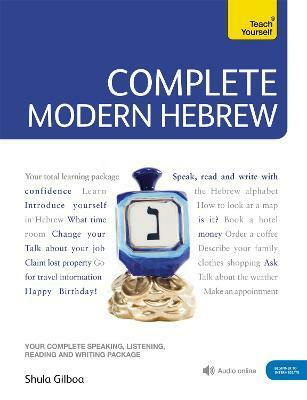 Speak, read and write Modern Hebrew confidently with this best-selling course from Teach Yourself - the No. 1 brand in language learning. Learn everyday, useful Modern Hebrew through real-life situations that make grammar and vocabulary meaningful and memorable. This edition makes learning effective and engaging with an easy-to-read page design and complete audio support. By the end of this course you will be at B2 of the Common European Framework (CEFR) for languages: Can interact with fluency and spontaneity and produce clear, detailed text on a wide range of subjects and to explain a viewpoint. Shula Gilboa was born and lives in Israel. She has taught Hebrew as a second language internationally.